Histone methylation plays an important role in regulating gene expression, and it can act in epigenetic memory system, thus deciding fates of cells and their identities. The jumonji C (jmjC) domain-containing proteins have been shown to reverse histone methylation in nonplant model systems. However, knowledge of the jmjC domain-containing histone demethylase that is involved in pollen development and fertilization in plants remains limited. In this study, BcJMJ30 (Brassica campestris Jumonji 30), encoding a putative jmjC domain-containing protein that is up-regulated after pollination of sterile pistils and fertile flower buds, has been cloned in the genic male sterile AB line (Bajh97-01A/B) of Chinese cabbage-pak-choi (B. campestris L. ssp. chinensis Makino). 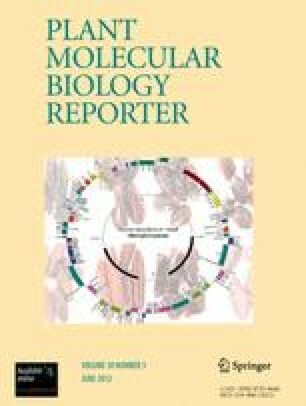 Phylogenetic analysis has revealed that the BcJMJ30 was closely related to At3g20810 (AtJMJ30) in Arabidopsis, which belongs to the JMJD5 subgroup of the jmjC domain-only group. Spatial and temporal expression patterns analysis by RT-PCR and qRT-PCR indicates that transcripts of BcJMJ30 was preferentially expressed in stamens of fertile flower buds and are steadily expressed in pistils following pollination. In situ hybridization results have revealed that BcJMJ30 is expressed in both pollen and tapetum. In general, these results indicated that BcJMJ30 is a novel gene, with a jmjC domain-only that may be involved in pollen development and fertilization. This work was supported by the Key Sci-Technology Project of Zhejiang Province (No. 2010 C12004) and the Natural Science Foundation of Zhejiang Province (Y3100300).